Since 2005 CEMLA’s central banks have conducted joint research activities to bolster economic research on topics of mutual interest. Annual or multi annual joint research activities have been developed in the following topics: 1) Estimation and use of non observable variables in the region; 2) The development of dynamic stochastic general equilibrium models; 3) The transmission mechanism of monetary policy; 4) Economic policy responses to the financial crisis; 5) Inflationary dynamics, persistence and price and wage formation; 6) Capital flows and its macroeconomic impact; 7) Asset pricing, global economic conditions and financial stability; 8) Monetary policy and financial stability in small open economies; 9) Monetary policy and financial stability; 10) International spillovers of monetary policy; 11) Monetary policy and financial conditions; 12) Households’ financial decisions; and 13) Inflation expectations: Their measurement and degree of anchoring. In 2014, CEMLA’s central banks decided that they would conduct a joint research on Monetary policy and financial stability. The joint research group organized their discussion around three general questions: 1) How does monetary policy affect financial stability? ; 2) How should the monetary authority incorporate financial stability considerations? ; and 3) How does international financial integration constrain monetary policy and prudential regulatory policies? The documents collected in this book provide answers to some aspects of these questions. CEMLA coordinated this joint research with participation of researchers from the central banks of Bolivia, Brazil, Dominican Republic, Guatemala, and Mexico. Research work was supported by webinars of academic specialists, virtual meetings where research progress was presented, a workshop at CEMLA, and presentations at the XIX Meeting of the Central Bank Researchers Network of the Americas. 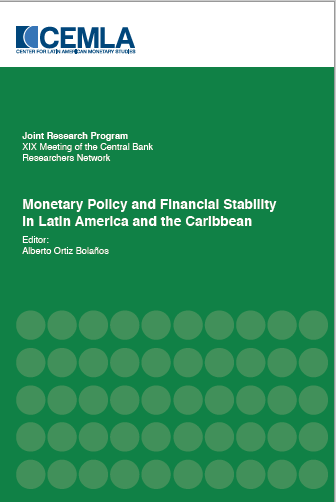 The documents that integrate this book represent a memoir of the work done by this group of researchers and it gives an analysis of different aspects of the interactions of monetary and financial stability. This book, in line with CEMLA’s objectives, promotes a better understanding of monetary and banking matters in Latin America and the Caribbean. Manager of Economic Research at the Center for Latin American Monetary Studies (CEMLA) and Research Professor at EGADE Business School of Tecnológico de Monterrey. His main research areas are 1) the study of macro financial linkages; 2) the measurement of the sources of economic fluctuations in emerging markets; and 3) the analysis of macroeconomic and financial regulation policies. Among others phenomena, he has analyzed the economic consequences of credit market imperfections and the role of monetary policy and credit contract indexation in economic stabilization; has compared the relative importance of domestic and foreign factors in emerging market economic fluctuations and the role and interaction of monetary and fiscal policies for economic outcomes; and has also studied the determinants of capital buffers in a panel of more than 7,000 banks across 143 countries and he has analyzed the role of banks’ net stable funding ratio in explaining future financial instability. At CEMLA, Dr. Ortiz conducts research in the above mentioned areas, coordinates conferences, seminars, courses and research related activities. A big part of his efforts are aimed at supporting the coordination of research activities among central bank researchers from CEMLA’s membership, including: the Joint Research program, the internship program and the on-line research seminars. Regarding his academic activies, Dr. Ortiz has taught courses on Microeconomics of Banking, Market Failure in Financial Markets, Macroeconomic Theory, Money and Banking, Open Macroeconomics, Economic Development, Mathematical Methods for Economists, Economic Environment of the Organization, Fundamentals of Global Business, Fundamentals of Economics and International Financial Policy at Boston University, Oberlin College and Harvard University. He earned his PhD in Economics from Boston University in 2009, having previously acquired a Master Degree in Political Economy at the same institution and a Bachelor Degree in Economics from the Centro de Investigación y Docencia Económicas (CIDE) in 2002. This paper explores the existence of a bank lending channel for Bolivia. The estimates used panel data through GMM and fixed effects model. The results show that changes in monetary policy have direct effects on the banks’ loans supply, because increases in the securities’ supply lead to reductions in loan growth. Moreover, interactions size and capital of entities with variable monetary policy would reflect the existence of different bank’s reactions. Keywords: monetary policy, lending channel, GMM. previous studies have concluded that the monetary policy transmission mechanism is rather weak. However, the empirical evidence of those studies is based on aggregate data. This paper contributes by performing detailed analysis of individual data for each bank, classified by bank size and loan type. The hypothesis is that policy transmission is heterogeneous by these characteristics. First, a descriptive analysis of the response of interest rates and lending to policy rate variations is carried out. Second, econometric panel data techniques are applied to estimate the lending channel. We find that there is a transmission of monetary policy, but it is heterogeneous, and liquidity, capitalization and bank size play an important role in it. The factors contributing to weakening the mechanism are excess liquidity in the banking system, portfolio dollarization, bank size and the method for calculating reserve requirement. Keywords: monetary transmission mechanisms, credit channel, financial stability. This study provides evidence of the relation between credit and real activity in Central America and the Dominican Republic (DR). The link between credit and real activity is addressed for the case of a group of developing countries with limited financial markets where bank credit is the main source of external finance for the private sector. We compile information of credit to the private sector and the aggregate economic activity for Costa Rica, El Salvador, Honduras, Guatemala, Nicaragua and the DR. The data is analyzed using simple statistical tools (Granger causality tests and spectral analysis) to identify stylized facts on the credit-activity relation. We find a positive relation between credit and real activity in frequencies associated to business cycles for all countries. The credit-economic relation in cycles lasting 10 or more years seems relevant in Costa Rica and the DR. There is evidence suggesting that credit precedes economic activity at business cycles frequencies in Costa Rica, El Salvador, Honduras, Nicaragua and the dr. Excluding Nicaragua, this pattern is observed also in cycles over eight years for mentioned economies. In case of Guatemala there is no evidence of statistical precedence of credit to economic activity. Keywords: credit cycle, banking credit, business cycle, developing countries, Central America, Dominican Republic. JEL classification: C32; E32; E51. In this chapter, we conduct an empirical study of fluctuation patters of regulatory capital buffers with respect to the business cycle for the 2001 to 2003 period with data of 18 countries and 456 Latin American and Caribbean banks. We also present results for Argentina, Brazil, Mexico, Panama and Venezuela. Our results show that, although the general intuition sustaining the countercyclical approach of Basel III capital buffers agrees with the data, patterns vary across countries, being determining variables bank size, their forms of organization and levels of competition in the region’s banking systems. Keywords: capital buffers, procyclicality, business cycle, Basel III, Latin America. Decreases (increases) in long-term interest rates caused by compressions (dilations) of term premiums could be financially expansive (contractive) and might require monetary policy restraints (stimulus). This paper uses measures of the term premium calculated by Adrian et al. (2013) to perform Bayesian estimations of a Markov-switching vector autoregression (MS-VAR) model as Hubrich and Tetlow (2015), finding evidence of the importance of allowing for switching parameters (nonlinearities) and switching variance (non-Gaussian) when analyzing macrofinancial linkages in the United States. Using the specification with the best fit to the data of two Markov states for parameters and three Markov states for variances, we estimate a Markov-switching dynamic stochastic general equilibrium (MS-DSGE) macroeconomic model with financial frictions in long-term debt instruments developed by Carlstrom et al. (2017) to provide evidence on how financial conditions have evolved in the us since 1962 and how the Federal Reserve Bank has responded to the evolution of term premiums. Using the estimated model, we perform a counterfactual analysis of the potential evolution of macroeconomic and financial variables under alternative financial conditions and monetary policy responses. We analyze six episodes with the presence of high financial frictions and/or medium and high shocks volatility. In three of them there was a high monetary policy response to financial factors: 1978Q4-1983Q4 which helped to mitigate inflation at the cost of economic activity, and the 1990Q2-1993Q4 and 2010Q1-2011Q4 episodes in which the high response served to mitigate economic contractions. Meanwhile, in the three episodes where low response to financial factors is observed, if the monetary authority had responded more aggressively, from 1971Q1-1978Q3 it could have attained lower inflation at the cost of lower GDP, from 2000Q4-2004Q4 it could have delayed the GDP contraction to 2002Q3, but this would have been deeper and inflation larger, and in 2006Q1-2009Q4 it might have precipitated the GDP contraction. The presence of high financial frictions and high shock volatility makes recessions deeper and recoveries more sluggish showing the importance of the financial-macroeconomic nexus. Keywords: monetary policy, term-structure, financial frictions, Markov switching VAR, Markov-switching DSGE, Bayesian maximum likelihood methods. JEL classification: El2, E43, E44, E52, E58, C11. This chapter empirically compares the implications of two distinct models of FX intervention, within the context of inflation targeting regimes. For this purpose, it applies the VAR methodology developed by Kim (2003) to the cases of Mexico and Brazil. Our results can be summarized in three points. First, FX interventions have had a short-lived effect on the exchange rate in both economies. Second, the Brazilian model of FX intervention entails higher inflationary costs and this result cannot be entirely explained by differences in the level of pass-through. Third, each model is associated with a different interaction between exchange rate and conventional monetary policies. Keywords: foreign exchange intervention, exchange rate, inflation, exchange rate pass-through, monetary policy. JEL classification: F31, E31, E52. This chapter proposes a novel orthogonality condition based on realized volatility that allows instrumental variable estimation of the effects of spot intervention in foreign exchange markets. We consider parametric and nonparametric instrumental variable estimation and propose a test based on the average treatment effect of intervention. We apply the method to a unique dataset for the BRL/USD market with full records of spot intervention and net order flow intermediated by the financial system. Overall the average effect of a one billion dollars sell or buy intervention is close to 0.51% depreciation or appreciation, respectively, estimated in the linear framework, which is therefore robust to nonlinear interactions. The estimates are a bit lower when controlling for derivative operations, which suggests the intervention policies (spot and swaps) are complementary. Keywords: realized volatility, intervention, exchange rate, order flow, instrumental variable, nonparametric.